HEY! My name is Kevin and I hope you like my site! I'm the headmaster to this site and I hope you enjoy it! Please send me any comments or suggestions by clicking on the link at the bottom of the page! tell everyone I'm a fan of Harry Potter! to try and make a cool site! to get house points for Hufflepuff! Welcome to my web site! 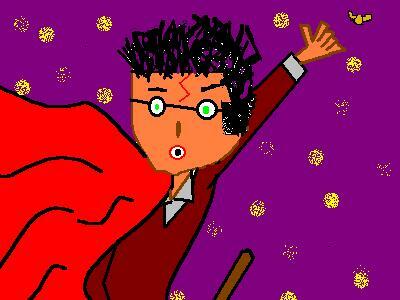 I love Harry Potter and this site is dedicated to him! Please feel free to click on any of the links to get around my site! Here are a couple of links to get around my site! click on Harry to hear the low down on the rumors! Online Hogwarts has a link on the bottom and I suggest you check that out! It is a realistic roleplay Hogwarts site where you can get sorted, play for house points, and join the quidditch team! I go to Hogwarts and got sorted into Hufflepuff! happy to give you a ride! Hey! Any questions, comments, or suggestions can be e-mailed to me by clicking on Dumbledore! This actually might be the book 5 cover! I got this seal from hogwarts online! Please click on the link to Online Hogwarts that is above. It is easy to recognize because it is a big picture of Hagrid!